The CD157 antigen (BST-1) is a highly glycosylated, glycosyl-phosphatidylinositol (GPI)-anchored membrane protein with a molecular weight of 43 kDa. The amino acid sequence of human BST-1 has 33% identity with CD38. As with CD38, BST-1 displays ADP ribosyl cyclase activity and facilitates pre-B cell growth. 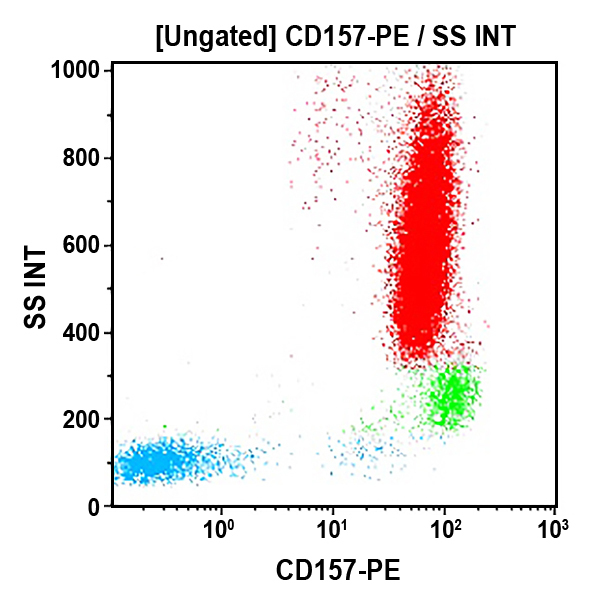 CD157 antigen is expressed on monocytes, neutrophils and all lymphoid and myeloid precursors. Its expression is restricted to certain fractions (CD44-CD25+ and CD44-CD25-) of CD3-CD4-CD8- T progenitors.